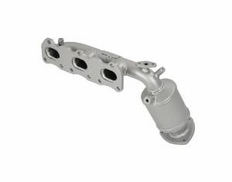 1999-2005 Suzuki Grand Vitara 2.5, 2001-2005 XL7 2.7, 2001-2004 Chevy Tracker 2.5 Pacesetter Catted Exhaust Manifold (Passenger Side)5RichFebruary 12, 2017The Pacesetter catted exhaust manifold is an excellent product! Exact fit as the OEM model. Help me eliminate SES light due to cracked manifold and non functioning cat converter.! The part number for this item is 757432 and it fits 1999-2005 Suzuki Grand Vitara (2.5 Models), 2001-2005 Suzuki XL7 (2.7 Models), 2001-2004 Chevy Tracker (2.5 Models) models. This is the Front, Passenger Side exhaust manifold only.